Regatta’s location on an urban waterfront makes for challenging sailing conditions. SAN DIEGO ― There’s no place like home. Tyler Sinks proved this motto to be the case as he and his crew delivered the Sir Thomas Lipton Cup trophy home to San Diego Yacht Club on Oct. 29. Sinks skippered the J/105 into first place with crewmembers Jake La Dow, Erik Shampain, Melissa Denman, Jake Reynolds, Max Hutcheson and Chris Busch; it was his second Lipton Cup win in three years. The winning sailor gave full credit to his crew for the recent win saying skippering is the easiest job when competing in regattas. Did the San Diego YC team have a different strategy this year after placing third last year? “We didn’t change a whole lot, mindset wise,” Sinks responded. “I felt like last year we sailed equally as good with maybe a few less mistakes. “I think the experience of doing this regatta a few times now has definitely played to our benefit,” Sinks added. Does the yacht club hosting the regatta have a home team advantage? “From a San Diego Yacht Club perspective and from a member perspective, I actually feel like we have the hardest local event to win,” Sinks answered. The Lipton Cup is more challenging than other yacht club sailing competitions for several reasons, according to Sinks. Sinks said the second reason why the Lipton Cup is so challenging, even to the host team, is the venue being in downtown San Diego on the city-front. The third and final explanation Sinks gave for the difficulty of the Lipton Cup: having one team per yacht club. “The format makes it very fair [and also] makes it very hard to consistently win the event,” Sinks said. The writer of this article asked Sinks if this regatta is similar to a long-distance race where runners pace themselves to conserve energy and then sprint at the end. “I would say that’s probably the best way to describe it,” Sinks responded. “The thing that I always say about the Lipton Cup is – it’s a marathon not a sprint. “It’s not uncommon for a team to have a really strong day – especially the first or second day – and be in a position to potentially win the event, but Sunday is really when the regatta is won,” Sinks continued. The strategy for the first couple days of the race is to not lose, while the final day of the race is the fight to win, according to Sinks. Sinks admitted he might be biased but he thinks California – and, more specifically, San Diego – is his favorite place to sail (with the exception of possibly the Caribbean and Hawaiian Islands). Sailing on the West Coast is better than on the East Coast, in his opinion. He points out he did live in Boston for four years. “I’d say a combination of the best sailors, good wind conditions year round and a fantastic venue and host club like San Diego Yacht Club makes it almost unrivaled,” Sinks stated. Sinks started sailing at the age of six. He was enrolled in the summer sailing program at San Diego YC as soon as he was old enough. He said one of the highlights of his career was at the age of 13 when he won the sabot nationals for the first time. Sinks sees sailing going in many different directions today compared to 20 years ago or less when he was a kid sailing on monohulls. “Now a days, it seems like the competitions get spread out amongst so many different classes.” Sinks said. “I’d rather compete in one or two classes with everybody in the world and have all the best guys sailing one or two boats versus 50 or 100 different classes with a lot less people. The 28-year old sailor has no Olympic aspirations. He plans to continue competing in club challenges. He likes the competition between amateur and professionals who are sailing for the love of the sport and not for money. Sinks may be the exception to the rule among his sailing comrades saying many of his close friends he competed with in school have continued successfully sailing on at an international and professional level. His friends Charlie Buckingham and Cy Thompson competed in the 2016 Olympic Games. He said Buckingham is campaigning to compete again in the 2020 Olympics in Tokyo. A teammate of his from Newport Beach, Michael Menninger, just won the 2017 Worlds Etchells Championship. 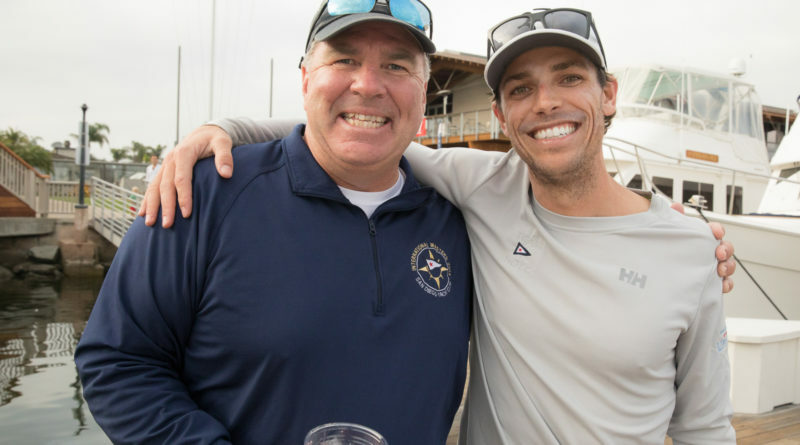 “One of my best friends and college roommates, Taylor Canfield, has won the World Match Racing Tour and continues to be one of the top match racers in the world competing professionally,” Sinks said. “I chose to get a desk job,” Sinks added. Sinks does have a world title under his skipper belt. He was the team captain during the Team Racing World Championship a couple years ago. He said he learned out lot from Menninger, who was on his team. “That’s the first World Championship and the only one that I’ve won,” Sinks said. Working a full-time day job in commercial real estate while taking evening classes and pursuing a master’s degree at University of San Diego does not leave much time for Sinks to sail these days. Sailing has taken a bit of a backseat for Sinks as he focuses on his studies and his professional career, but he does plan to continue. Sinks mentioned water sports have always been a part of his life from sailing and paddle boarding to swimming and surfing. “Sailing is a way to connect with the ocean and stay involved,” Sinks said.